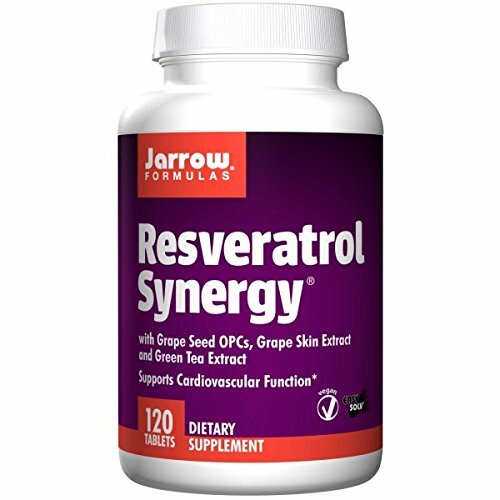 Jarrow Formulas, Resveratrol Synergy, 120 Tablets. Pack of 8 bottles. Jarrow Formulas® Resveratrol Synergy® brings together resveratrol (3,4',5-trihydroxystilbene) and other powerful antioxidants resulting in a potent synergistic formula that supports the cardiovascular system. Pterostilbene, also known as dimethylresveratrol, is a naturally occurring, methylated form of resveratrol. Methylation greatly improves intestinal and cellular uptake of this important phytochemical while reducing excessive liver clearance. Ingredients: Vitamin C 100 mg, Resveratrol 20 mg, Green Tea Extract 200 mg, Quercetin 100 mg, Grape Skin Extract 100 mg, Grape Seed Extract 50 mg, trans-Pterostilbene (pTeroPure) 5 mg. Other Ingredients: Cellulose, calcium phosphate, maltodextrin, stearic acid (vegetable source), magnesium stearate (vegetable source), silicon dioxide and a food grade coating. Suggested Usage:Take 1 tablet per day with food or juice or as directed by your qualified healthcare professional. Jarrow Formulas, Resveratrol Synergy, 120 Tablets. Pack of 8 bottles. If you have any questions about this product by Jarrow Formulas, contact us by completing and submitting the form below. If you are looking for a specif part number, please include it with your message.